I can still remember that giddy feeling I had seven years ago, when I first read about the “zombie ant.” The story was gruesome and fascinating, and it was everywhere. Even friends and family who aren’t so interested in science knew the basics: in a tropical forest somewhere there’s a fungus that infects an ant and somehow takes control of the ant’s brain, forcing it to leave its colony, crawl up a big leaf, bite down and wait for the sweet relief of death. A grotesque stalk then sprouts from the poor creature’s head, from which fungal spores rain down to infect a new batch of ants. A fungal fruiting body erupts through the head of a carpenter ant infected by a parasitic fungus in Thailand. Credit: David Hughes, Penn State University. The problem is, it doesn’t happen quite like that. David Hughes , the Penn State University entomologist who reported his extensive field observations of the fungus/ant interactions in BMC Ecology , which caused much excitement back in 2011, has continued to study the fungus, Ophiocordyceps unliateralis, and its carpenter ant host, Camponotus leonardi. In late 2017, Hughes and his colleagues published an article in PNAS in which they used sophisticated microscopy and image-processing techniques to describe in great detail how the fungus invades various parts of the ant’s body including muscles in its legs and head. Although Hughes’s earlier BMC Ecology paper showed fungus in the head of an ant, the new study reveals that the fungus never actually enters the brain. To me, the new finding somehow made the fungus’ control over the ant even more baffling. What exactly was going on? To find out, I spoke with Hughes and his graduate student Maridel Fredericksen. Every one of our thoughts, emotions, sensations, and movements arise from changes in the flow of electricity in the brain. Disruptions to the normal flow of electricity within and between cells is a hallmark of many diseases, especially neurological and cardiac diseases. The source of electricity within nerve cells (i.e., neurons) is the separation of charge, referred to as voltage, across neuronal membranes. In the past, scientists weren’t able to identify all the molecules that control neuronal voltage. They simply lacked the tools. Now, University of Colorado biologist Joel Kralj has developed a way to overcome this hurdle. His new technique—combining automated imaging tools and genetic manipulation of cells—is designed to measure the electrical contribution of every protein coded by every gene in the human genome. Kralj believes this technology will usher in a new field of “electromics” that will be of enormous benefit to both scientists studying biological processes and clinicians attempting to treat disease. In 2017, Kralj won a New Innovator Award from the National Institutes of Health for his work on studying voltage in neurons. He is using the grant money to develop a new type of microscope that will be capable of measuring neuronal voltage from hundreds of cells simultaneously. He and his research team will then attempt to identify the genes that encode any of the 20,000 proteins in the human body that are involved in electrical signaling. This laborious process will involve collecting hundreds of nerve cells, genetically removing a single protein from each cell, and using the new microscope to see what happens. If the voltage within a cell is changed in any way when a specific protein is removed, the researchers can conclude that the protein is essential to electrical signaling. In this video, Kralj discusses how he plans to use his electromics platform to study electricity-generating cells throughout the body, as well as in bacterial cells (see our companion blog post “Feeling Out Bacteria’s Sense of Touch” featuring Kralj’s research for more details). Dr. Kralj’s work is funded in part by the NIH under grant 1DP2GM123458-01. Our sense of touch provides us with bits of information about our surroundings that inform the decisions we make. When we touch something, our nervous system transmits signals through nerve endings that feed information to our brain. This enables us to sense the stimulus and take the appropriate action, like drawing back quickly when we touch a hot stovetop. Bacteria are single cells and lack a nervous system. But like us, they rely on their “sense” of touch to make decisions—or at least change their behavior. For example, bacteria’s sense of touch is believed to trigger the cells to form colonies, called biofilms, on surfaces they make contact with. Bacteria may form biofilms as a way to defend themselves, share limited nutrients, or simply to prevent being washed away in a flowing liquid. Humans can be harmed by biofilms because these colonies serve as a reservoir of disease-causing cells that are responsible for high rates of human infection. Biofilms can protect at least some cells from being affected by antibiotics. 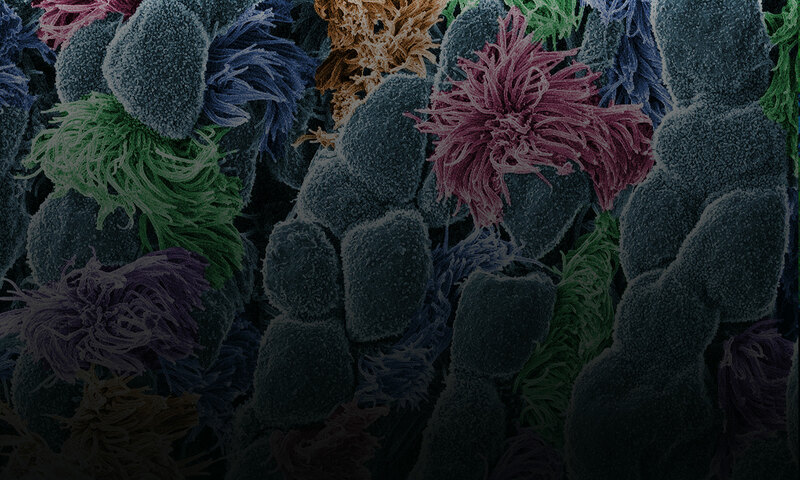 The surviving reservoir of bacteria then have more time to evolve resistance to antibiotics. At the same time, some biofilms can be valuable; for example, they help to break down waste in water treatment plants and to drive electrical current as part of microbial fuel cells. Until recently, scientists thought that bacteria formed biofilms and caused infections in response to chemical signals they received from their environments. But research in 2014 showed that the bacterium Pseudomonas aeruginosa could infect a variety of living tissues—from plants to many kinds of animals—simply by making contact with them. In the past year, multiple groups of investigators have learned more about how bacteria sense that they have touched a surface and how that sense translates to changes in their behavior. This understanding could lead to new ways of preventing infections or harmful biofilm formation. Pili (green) on cells from the bacterium Caulobacter crescentus (orange). Scientists used a fluorescent dye to stain pili so they could watch the structures extend and retract. Credit: Courtney Ellison, Indiana University. When they first make contact with a surface, bacteria change from free-ranging, swimming cells to stationary ones that secrete a sticky substance, tethering them in one place. To form a biofilm, they begin replicating, creating an organized mass stable enough to resist shaking and to repel potential invaders (see https://biobeat.nigms.nih.gov/2017/01/cool-image-inside-a-biofilm-build-up/).